The divergent personalities of McCain and Trump were on a collision course from the beginning. “I can’t trust [Barack] Obama. I have read about him and he’s not, he’s … he’s an Arab,” the woman said of the Democratic presidential nominee. McCain started shaking his head before she even finished her question, taking the microphone and pushing back emphatically on her incorrect statement. The response was classic McCain — his trademark “straight talk” he honed on the campaign trail for nearly four decades, along with his willingness to often take the high road, even if it wasn’t politically popular. His positive comments about his opponent were met with boos by some in the audience, and perhaps signaled a shift within the GOP that McCain would criticize for the remainder of his life. The Arizona senator died Saturday at 81 from brain cancer. Contrast McCain’s approach with Donald Trump’s fast rise in politics, which was driven, in part, by pushing the false narrative that Obama wasn’t an American citizen and had forged his birth certificate. That narrative established Trump as one of the leading voices in the “birther” movement. Trump would go on to become president by embracing that type of much more combative, confrontational tone that hinged on conspiracy theories and divisive rhetoric. McCain would never make it to the Oval Office, but in the final years of his life, he fully personified his “maverick” nickname by becoming one of the leading GOP voices against Trump as the two repeatedly clashed. The divergent personalities of McCain and Trump were on a collision course from the beginning. McCain represented the old guard of Washington, a lion of the Senate who evoked respect from both sides of the aisle and believed honor was everything. Trump ushered in a new — many would say corrosive — era of American politics, in which insults are hurled at the ready, tribalism is paramount and apologies should never be doled out. The son of decorated Navy admirals, McCain followed in their footsteps, graduating from the U.S. Naval Academy and then deploying to Vietnam. It was there that he was captured by North Vietnamese forces when his aircraft was shot down. Transported to the infamous “Hanoi Hilton,” he was beaten and tortured. Offered early release because of his father’s status, McCain refused unless all the prisoners captured before him were also released. It was 5 1/2 years before he would be freed. Upon his return to U.S. soil, McCain would become the consummate political insider, spending four years in the House before being elected to the Senate in 1986. He was honest about his failures in office, too, especially after he was ensnared in the “Keating Five” scandal. “John, again, was motivated by doing the right thing. And there were times where he said, ‘This is going to cause me huge grief politically, but it’s the right thing to do. I’ll go for it.’ I saw it over and over again,” Senate Minority Leader Chuck Schumer recalled to NPR’s Michel Martin on Weekend All Things Considered. A failed 2000 bid for president gave rise to a successful run at the Republican nomination eight years later. 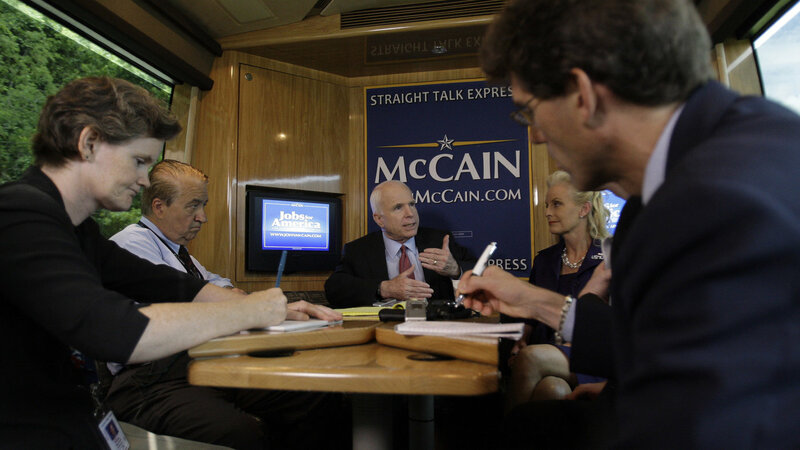 In those campaigns, McCain became known for his openness with voters and the press. 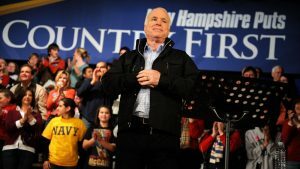 He thrived in town hall settings, and New Hampshire would kick-start his first bid for the White House and revive his sagging hopes in 2008 after his campaign had been left for dead. 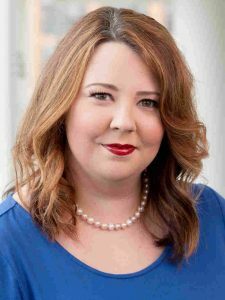 McCain’s controversial choice of Alaska’s then-governor, Sarah Palin, as his running mate, in many ways may have opened the door for a candidate like Trump. Palin never seemed to mesh with McCain’s more reserved, traditional style, and her hits on the media and giddiness in attacking Obama and others in personal terms seemed to presage a candidate like Trump. So, it was no surprise when Palin endorsed the billionaire businessman during the 2016 cycle. McCain never really slammed the press in the way that Trump revels in. Sure, he may have given plenty of reporters a hard time, but in the wake of his death, countless journalists recalled how he would still gladly speak to them, give a quote and even sometimes apologize if he had hassled them wrongly about a story. McCain’s clash with Trump was boiling from the very beginning of the now-president’s unlikely rise. After Trump kicked off his campaign in June 2015, McCain made it known he took issue with the reality TV star’s characterization of Mexican immigrants as “rapists” who were bringing crime into the country. The biggest flashpoint in their feud happened the next month, at an event in Iowa. With tensions already simmering, Trump disparaged McCain’s military service, saying that McCain wasn’t a war hero and that Trump preferred “people who weren’t captured.” Trump received multiple education deferments for Vietnam, and then a final one for bone spurs. McCain was later under pressure to back Trump once it became obvious he would win the nomination. The Arizona senator had pledged he’d back the GOP nominee, and he was facing a primary challenge from the right during his own 2016 re-election battle. Eventually, he would do so begrudgingly, though he declined to attend the Republican National Convention. But the détente wouldn’t last. In October 2016, McCain was one of many lawmakers who rescinded support for Trump in the wake of the Access Hollywood tape. Their relationship, if it could even be called one by that point, would never be repaired. In his final years in the Senate, McCain seemed almost emboldened to be a check on Trump as he embraced his elder statesman role with a renewed sense of patriotic obligation. The more than 30-year Senate veteran was beholden to no one now, knowing perhaps he had already run his final race even before he would receive his fatal cancer diagnosis in the summer of 2017. 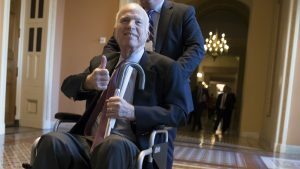 Absent from the Senate for much of the past year, McCain nonetheless remained a loud voice in statements against the use of torture and on matters of foreign policy — striking a strong tone against Russia all while at the same time Trump would lavish praise on the country and its leader, Vladimir Putin. The action that Trump would come to resent the most came in the wee morning hours of July 28, 2017, when McCain gave a dramatic thumbs down to the Senate GOP plan to repeal the Affordable Care Act. 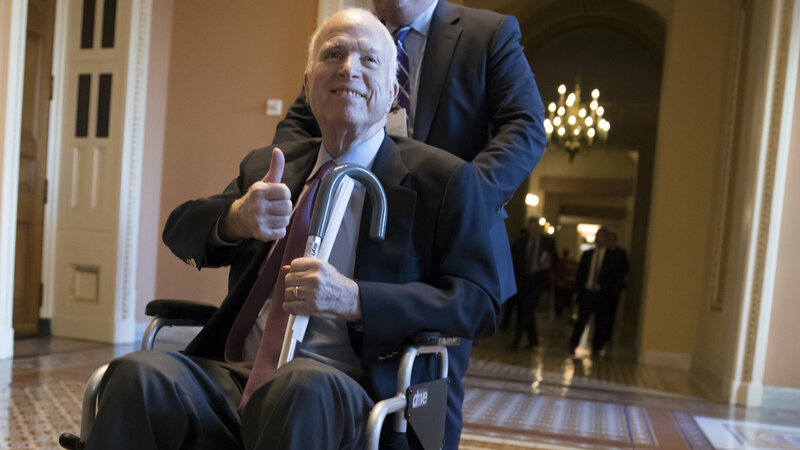 Having returned to the Senate shortly after his diagnosis of brain cancer, McCain’s decision whether to vote “yay” or “nay” remained a mystery even among his own party’s leadership. Then he strode to the floor, stuck out his hand, and cast his no vote, sinking not only the bill’s chances but any hopes Republicans might have had of following through on a years-long promise to repeal and replace Obamacare. The almost-Shakespearean drama that played out was one Trump would love to re-enact in the coming months to his voracious rally crowds. He’d rarely use McCain’s name, but it was clear who the president was talking about even as the senior senator was at home in Arizona fighting for his life. Trump’s final snub of the revered senator came just two weeks ago, when he signed the 2019 military authorization funding bill, which McCain’s colleagues had named in honor of the ailing Senate Armed Services Committee chairman. But in the signing ceremony, Trump would never utter McCain’s name. And when news came Saturday that McCain had died, the president would issue a single tweet, expressing his “deepest sympathy” and offering “prayers” to the senator’s family. The Washington Post reported Trump nixed a more laudatory statement praising McCain’s military and political service. In one of McCain’s final Senate floor speeches shortly after he returned following his ultimately fatal diagnosis, the lawmaker opined on the current caustic state of politics and the lack of compromise and he underscored the importance of Congress as a co-equal branch to the president, designed to be a check on the executive branch. “I hope we can again rely on humility, on our need to cooperate, on our dependence on each other to learn how to trust each other again and by so doing better serve the people who elected us. Stop listening to the bombastic loudmouths on the radio and television and the Internet. To hell with them. They don’t want anything done for the public good. 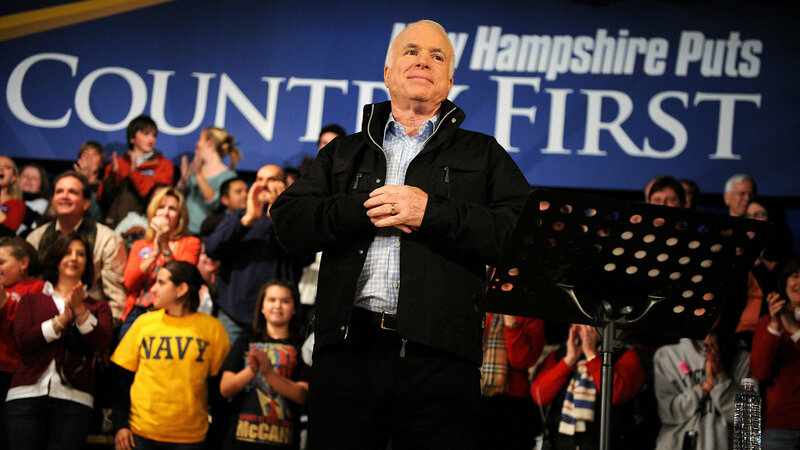 Our incapacity is their livelihood,” McCain bemoaned. And even in the midst of bruising political campaigns, McCain often tried to take the high road. The bitter 2000 South Carolina primary against eventual winner George W. Bush was marked by false allegations that he had fathered a black child (when, in fact, he and his wife had adopted their daughter Bridget from a Bangladesh orphanage). McCain’s aides wanted to respond in kind, but he forbade them. And in one instance where he did bow to political expediency on the issue of whether the Confederate flag should have been taken down from atop the South Carolina House, he later returned to the state to apologize — a rarity in politics even back then, let alone today. But even personal attacks aside, McCain saw there was something greater than wins and losses, or even words said in the heat of political battle. After all, the two men who ended his White House dreams, Bush and Obama, will reportedly deliver eulogies at his funeral — a final statement of “Country First” from what seems like a bygone era.